Pancreatic transplant remains the only treatment that cures insulin-dependent diabetes mellitus. It is recognized by transplant surgeons that donor pancreases with excessive fat infiltration have a poorer clinical outcome, resulting in significant recipient morbidity and mortality. However, no objective measure of pancreatic fat infiltration exists, and no study has been done that correlates the level of fat infiltration with clinical outcome. There have been significant radiologic advances that allow assessment of fat content of organs, and these could be used to accurately quantify the extent of pancreatic fat infiltration. We reviewed the literature regarding pancreatic steatosis, and examined ways in which the level of steatosis could be objectively measured before transplant, thereby improving clinical outcome. 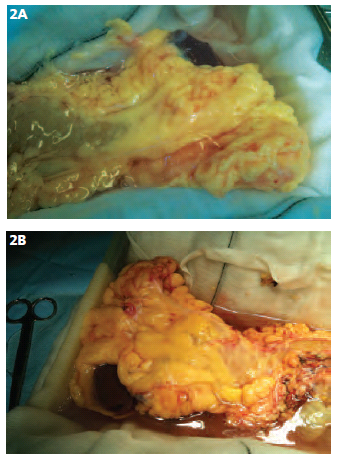 Transplant surgeons have noted that a pancreas visibly infiltrated by fat (Figure 1) at retrieval tends to have a much poorer clinical outcome. Pancreases that are deemed to have excessive fatty infiltration (Figure 2A and 2B) are not used. Yet this assessment is made by simply “eye-balling” the pancreas and assessing macroscopic evidence of fat infiltration; not by any objective measure. Hence, we sought to explore the phenomenon of pancreatic steatosis (fatty infiltration of the pancreas) and its implications for organ transplant. Ultimately, we wish to suggest ways to translate this clinical observation into objective measures that can be used to predict and improve clinical outcome. Pancreatic transplant remains the only treatment that normalizes glucose metabolism in patients with insulin-dependent diabetes mellitus; in fact, normoglycemia is usually established within minutes after reperfusion. Significant strides have been made since December 17th, 1966, when the world’s first clinical pancreas transplant was performed at the University of Minnesota Hospital in the United States.14 Therefore, we must make every effort to improve this treatment, given that it is our only hope of curing insulin-dependent diabetes mellitus. Studies also show an association between a high fat diet and adipocyte infiltration of pancreatic tissue both in humans and mice.15 In humans, we know that changes in composition of dietary fatty acids cause alterations in the pancreatic fatty acid composition.15 However, malnutrition also increases pancreatic steatosis.16 Work by Chehter and associates17 corroborates this finding: they showed that AIDS patients had an accumulation of lipid droplets in the pancreas, which may be a result of malnutrition and/or the HIV itself. Alcohol intake also closely correlates with pancreatic steatosis. Al-Haddad and associates2 demonstrated that patients with an alcohol intake of more than 14 grams/week had significantly more pancreatic hyperechogenicity than those with a lower alcohol intake. This fact was reflected in a study by Lopez and associates,16 in which 3 months of ethanol consumption by rats increased their pancreatic cholesterol ester content. A recently developed method—Iterative Decomposition with Echo Asymmetry and Least square estimation (IDEAL)—is a fat-water 3-dimensional technique, which produces separated fat and water images optimal in signal-noise ratio.35 It acquires 4 images, and each has a different relative phase between the fat and water signals. The echo times of the 4 images are chosen carefully to ensure that the highest signal-noise ratio is achieved in the reconstructed fat-only and water-only images. Risk factors for pancreatic steatosis include an increased body mass index2, 4 and advancing donor age.5 Pancreatic steatosis is a predisposing factor for pancreatitis.6, 7 Recipients are at a higher risk of graft pancreatitis if the donor is older8 or obese.9 One can extrapolate that pancreases from older donors with higher body mass indexes have more steatosis, and this predisposes them to graft pancreatitis. Obesity and diabetes are risk factors for pancreatic cancer7 and lead to increased dissemination and lethality of pancreatic cancer.25 Pancreatic steatosis is closely associated with obesity,1-4 impaired glucose tolerance and diabetes,4 and may be the intermediary link correlating obesity and diabetes with pancreatic cancer. It is clearly not in the best interest of the patient to transplant a pancreas that is at high risk of developing cancer. More work must be undertaken to understand whether steatosis is the link between age/obesity and increased risk and lethality of pancreatic cancer. Pancreatic steatosis itself is a direct risk factor for postoperative pancreatic fistula,7 which is obviously an undesired outcome of transplant surgery. It is evident that pancreatic steatosis is associated with significant ill effects on the graft and thereby the recipient. Hence, it is no longer acceptable for the assessment of fat accumulation to be based on the pancreas' appearance at retrieval. We must be able to quantify the amount of fat infiltrating the pancreas, and need to further study the clinical outcome of pancreatic steatosis. There have been significant radiologic advances which allow assessment of the fat content of organs, and these could be used to quantify pancreatic fat in an organ considered for transplant. IDEAL is a newer, 3-dimensional technique, that produces separated fat and water images with optimal signal-noise ratios.35 It captures images during breath-holding intervals, and it is much less susceptible to respiratory motion effects,36 compared with single-voxel magnetic resonance spectroscopy. It provides greater spatial resolution and anatomic detail than single-voxel magnetic resonance spectroscopy, and so can more accurately assess fat content of smaller organs such as the pancreas.36 IDEAL imaging allows reliable standardized fat suppression throughout the body, including the abdomen,38 and all images (in-phase, opposed-phase, fat-only, and water-only images) are obtained during a single acquisition.41 This allows simplification of magnetic resonance imaging protocols and therefore shorter scan times. The use of IDEAL is cost-effective, as it is compatible with essentially any pulse sequence and can be added to an existing magnetic resonance imaging protocol. One could postulate that there are two opportunities for the pancreas to be radiologically assessed before transplant—before and after retrieval. Before retrieval would involve performing a scan on the deceased/dying donor, which could understandably cause distress to the donor and their family. Scanning the organ after retrieval is more feasible given the short time required for magnetic resonance imaging scans. IDEAL scanning requires breath-holding intervals36; therefore, the implication of this on scanning a sole organ must be assessed further. Pancreas transplant remains the only option for curing insulin-dependent diabetics. However, despite this potentially large recipient pool, the widespread application of pancreas transplant has been hindered by the significant rate of surgical complications resulting in graft failure/loss and, more importantly, recipient morbidity and mortality.12 Pancreatic steatosis may be a contributing factor to this high rate of surgical complications. Hence, it must be properly assessed and quantified in potential donors to ensure that only optimal quality grafts are transplanted. This would considerably improve the chances of a successful outcome for the recipient. Eventually, we should aim towards a system of determining an acceptable level of fat accumulation in a given pancreas, to assess its suitability for transplant. Ogilvie RF. The islands of Langerhans in 19 cases of obesity. J Path and Bacteriol. 1933;37(3):473-481. Al-Haddad M, Khashab M, Zyromski N, et al. Risk factors for hyperechogenic pancreas on endoscopic ultrasound: a case-control study. Pancreas. 2009;38(6):672-675. Katz DS, Hines J, Math KR, Nardi PM, Mindelzun RE, Lane MJ. Using CT to reveal fat-containing abnormalities of the pancreas. AJR Am J Roentgenol. 1999;172(2):393-396. Lingvay I, Esser V, Legendre JL, et al. Noninvasive quantification of pancreatic fat in humans. J Clin Endocrinol Metab. 2009;94(10):4070-4076. Glaser J, Stienecker K. Pancreas and aging: a study using ultrasonography. Gerontology. 2000;46(2):93-96. Zyromski NJ, Mathur A, Yacey K, et al. Non-alcoholic steatopancreatitis (NASP) – obesity or leptin? J Surg Res. 2007;137:222. Pitt HA. Hepato-pancreato-biliary fat: the good, the bad and the ugly. HPB (Oxford). 2007;9(2):92-97. Stratta RJ. Donor age, organ import, and cold ischemia: effect on early outcomes after simultaneous kidney-pancreas transplantation. Transplant Proc. 1997;29(8):3291-3292. Hanish SI, Petersen RP, Collins BH, et al. Obesity predicts increased overall complications following pancreas transplantation. Transplant Proc. 2005;37(8):3564-3566. Troppmann C, Gruessner AC, Benedetti E, et al. Vascular graft thrombosis after pancreatic transplantation: univariate and multivariate operative and nonoperative risk factor analysis. J Am Coll Surg. 1996;182(4):285-316. Gruessner AC, Sutherland DE. Pancreas transplant outcomes for the United States (US) cases as reported to the United Network for Organ Sharing (UNOS) and the International Pancreas Transplant Registry (IPTR). Clin Transpl. 2008:45-56. Troppmann C, Gruessner AC, Dunn DL, Sutherland DE, Gruessner RW. Surgical complications requiring early relaparotomy after pancreas transplantation: a multivariate risk factor and economic impact analysis of the cyclosporine era. Ann Surg. 1998;227(2):255-268. Mathur A, Pitt HA, Marine M, et al. Fatty pancreas: a factor in postoperative pancreatic fistula. Ann Surg. 2007;246(6):1058-1064. Kelly WD, Lillehei RC, Merkel FK, Idezuki Y, Goetz FC. Allotransplantation of the pancreas and duodenum along with the kidney in diabetic nephropathy. Surgery. 1967;61(6):827-837. Pinnick KE, Collins SC, Londos C, Gauguier D, Clark A, Fielding BA. Pancreatic ectopic fat is characterized by adipocyte infiltration and altered lipid composition. Obesity (Silver Spring). 2008;16(3):522-530. López JM, Bombi JA, Valderrama R, et al. Effects of prolonged ethanol intake and malnutrition on rat pancreas. Gut. 1996;38(2):285-292. Chehter EZ, Longo MA, Laudanna AA, Duarte MI. Involvement of the pancreas in AIDS: a prospective study of 109 post-mortems. AIDS. 2000;14(13):1879-1886. Chaudry G, Navarro OM, Levine DS, Oudjhane K. Abdominal manifestations of cystic fibrosis in children. Pediatr Radiol. 2006;36(3):233-240. Lee Y, Wang MY, Kakuma T, et al. Liporegulation in diet-induced obesity. The antisteatotic role of hyperleptinemia. J Biol Chem. 2001;276(8):5629-5635. Lee Y, Ravazzola M, Park BH, Bashmakov YK, Orci L, Unger RH. Metabolic mechanisms of failure of intraportally transplanted pancreatic beta-cells in rats: role of lipotoxicity and prevention by leptin. Diabetes. 2007;56(9):2295-2301. Allen RD, Nankivell BJ, Hawthorne WJ, O'Connell PJ, Chapman JR. Pancreas and islet transplantation: an unfinished journey. Transplant Proc. 2001;33(7-8):3485-3488. University of Minnesota Web site. http://www.iptr.umn.edu/ annual_reports/2003_annual/home.html. International Pancreas Transplant Registry. 2003 Annual Reports. Assessed March 5, 2011. Troppmann C. Surgical complications. In: Gruessner RWG, Sutherland DER, eds. Pancreas Transplantation. New York, NY: Springer; 2004:206-237. Tan M, Kandaswamy R, Sutherland DE, Gruessner RW, Gruessner AC, Humar A. Risk factors and impact of delayed graft function after pancreas transplants. Am J Transplant. 2004;4(5):758-762. Mathur A, Zyromski NJ, Pitt HA, et al. Pancreatic steatosis promotes dissemination and lethality of pancreatic cancer. J Am Coll Surg. 2009;208(5):989-994; discussion 994-996. Buscail L, Escourrou J, Moreau J, et al. Endoscopic ultrasonography in chronic pancreatitis: a comparative prospective study with conventional ultrasonography, computed tomography, and ERCP. Pancreas. 1995;10(3):251-257. Siddiqi AJ, Miller F. Chronic pancreatitis: ultrasound, computed tomography, and magnetic resonance imaging features. Semin Ultrasound CT MR. 2007;28(5):384-394. Raeder H, Haldorsen IS, Ersland L, et al. Pancreatic lipomatosis is a structural marker in nondiabetic children with mutations in carboxyl-ester lipase. Diabetes. 2007;56(2):444-449. Dujardin M, Vandenbroucke F, Boulet C, Op de Beeck B, de Mey J. Indications for body MRI Part I. Upper abdomen and renal imaging. Eur J Radiol. 2008;65(2):214-221. Schwenzer NF, Machann J, Martirosian P, et al. Quantification of pancreatic lipomatosis and liver steatosis by MRI: comparison of in/opposed-phase and spectral-spatial excitation techniques. Invest Radiol. 2008;43(5):330-337. Kovanlikaya A, Guclu C, Desai C, Becerra R, Gilsanz V. Fat quantification using three-point dixon technique: in vitro validation. Acad Radiol. 2005;12(5):636-639. Hussain HK, Chenevert TL, Londy FJ, et al. Hepatic fat fraction: MR imaging for quantitative measurement and display--early experience. Radiology. 2005;237(3):1048-1055. Erratum in: Radiology. 2006;238(3):1078. Schick F, Machann J, Brechtel K, et al. MRI of muscular fat. Magn Reson Med. 2002;47(4):720-727. Pineda AR, Reeder SB, Wen Z, Pelc NJ. Cramér-Rao bounds for three-point decomposition of water and fat. Magn Reson Med. 2005;54(3):625-635. Hu HH, Kim HW, Nayak KS, Goran MI. Comparison of fat-water MRI and single-voxel MRS in the assessment of hepatic and pancreatic fat fractions in humans. Obesity (Silver Spring). 2010;18(4):841-847. Longo R, Pollesello P, Ricci C, et al. Proton MR spectroscopy in quantitative in vivo determination of fat content in human liver steatosis. J Magn Reson Imaging. 1995;5(3):281-285. Reeder SB, Pineda AR, Wen Z, et al. Iterative decomposition of water and fat with echo asymmetry and least-squares estimation (IDEAL): application with fast spin-echo imaging. Magn Reson Med. 2005;54(3):636-644. Yu H, Reeder SB, McKenzie CA, et al. Single acquisition water-fat separation: feasibility study for dynamic imaging. Magn Reson Med. 2006;55(2):413-422. General Electric Healthcare. IDEAL fat/water separation for Signa HDxt 1.5T. General Electric Company. 2008. Costa DN, Pedrosa I, McKenzie C, Reeder SB, Rofsky NM. Body MRI using IDEAL. AJR Am J Roentgenol. 2008;190(4):1076-1084. Reeder SB, McKenzie CA, Pineda AR, et al. Water-fat separation with IDEAL gradient-echo imaging. J Magn Reson Imaging. 2007;25(3):644-652. Reeder SB, Markl M, Yu H, Hellinger JC, Herfkens RJ, Pelc NJ. Cardiac CINE imaging with IDEAL water-fat separation and steady-state free precession. J Magn Reson Imaging. 2005;22(1):44-52. Limanond P, Raman SS, Lassman C, et al. Macrovesicular hepatic steatosis in living related liver donors: correlation between CT and histologic findings. Radiology. 2004;230(1):276-280. Figure 1. Mild fatty infiltration into the parenchyma of the pancreas. Photograph courtesy of Mr. Vassilios Papalois (consent obtained). Figure 2A and 2B. 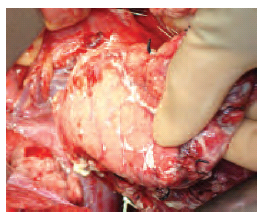 Massive infiltration of fat into the parenchyma of the pancreas and around the pancreas. Photograph courtesy of Mr. Vassilios Papalois (consent obtained). Figure 3. Graft pancreatitis post-transplant. Photograph courtesy of Mr. Vassilios Papalois (consent obtained).